"An adventure so big... even the world's richest kid can't afford to miss it!" Richie Rich is a family film starring Macauly Culkin who plays the role of the richest child who only wants the one thing he doesn't have: friends. 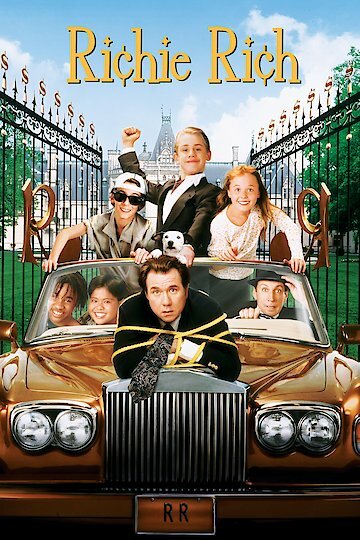 Soon enough a plan is devised by a man named Laurence Van Dough, who is the family business's top executive, to murder the boy's family, and Richie Rich is left to defend his father's name and his parents' lives with the help of a rag tag group of kids who slowly become the friends he has always wanted in his life. With clever wit, and mind boggling strategy, these children bring bravery, smarts, whimsy, and a boat load full of humor to the screen in their fight to save a family and their company from an envious, arrogant, manipulative, screwed up man who was falsely entrusted with the company's and decisions about the company's best interest. Growing ties with unexpected people and evolving friendships from ignorance. Richie Rich is currently available to watch and stream, buy on demand at Amazon, Vudu, Google Play, FandangoNow, iTunes, YouTube VOD online.